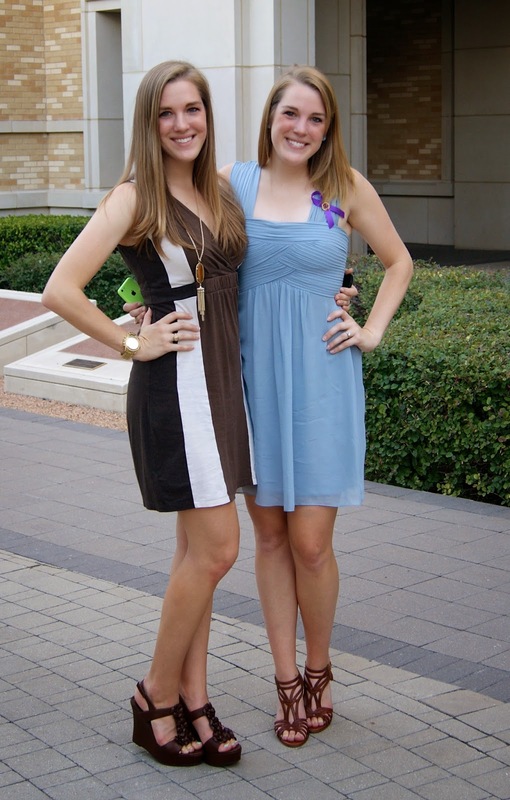 I mentioned Friday that my twin sister, Danielle, graduated from nursing school at TCU on Friday. Before we even knew the date she was graduating, I knew I would likely already be living in Virginia by the time her graduation rolled around. I also knew I wanted to fly down and try to surprise her. Surprising someone really shouldn't be that difficult. You fly down, you go somewhere you know they are going to be, and you pop out and yell "Surprise!". It's not rocket science, but Danielle made it oh so difficult. The thing is, Danielle and I talk multiple times a day and Facetime every single day. There was about a six hour period when I was flying where my phone was off, and that made her suspicious. Every time she Facetimed me, I quickly declined and made up some excuse why we could only talk on the phone. If we Facetimed, she would see that I was staying at my grandparents' house just 30 minutes away. Parker and I did everything we could to try to throw her off. He logged into both my Instagram and Facebook to post statuses/pictures so the location would show as Virginia. I gave her very specific details of what I was up to and what Parker and I planned on doing that weekend. He of course couldn't come too since the graduation was on a Friday, so he stayed back with the pups. The evening of the graduation, the twin was really suspicious. I mean the thing is, we practically have the same brain. Even if I did everything right, there is a good chance she would just guess it. Surprising your twin is like telling Jenny not to chase cats. It's just plain difficult. When I walked into the building she was graduating in with my family, you had to go a few floors up the elevator to get to the right room. Danielle was up there with the other graduates. I had my entire family go up first. This way, even if she did think I was coming, once she saw I wasn't with my family, she would lose hope. It sounds so cruel when I say it that way. Oh well, it was worth it. When I finally went up carrying the beautiful sign I had made, I spotted her in the crowd and waited for her to see me. As cheesy as it sounds, it was a moment I will never forget. Her eyes locked on mine, her mouth dropped open in shock, and she covered her mouth as the tears started rolling and ran towards me. By the time we hugged, I was in tears too. We made quite the scene in the middle of the room, and everybody was cheering and clapping like it was some sort of military homecoming, but we didn't care. We were just so happy to be reunited. It meant so much to both of us. That moment right there ranks in the top 5 moments of my existence. The rest of the weekend was perfect. I got to hang out with my family and grandparents, Danielle and I got to watch Friends on the couch together, and we found a delicious ice cream sandwich shop with some of the best desserts ever. If that's not a good weekend, I don't know what is. Perfect. I am so happy I got to be there this weekend to celebrate such a huge accomplishment and milestone in Danielle's life, and I am so glad the surprise went off without a hitch. We will treasure that moment forever! So proud of my idgy! Also, don't ask about the weird nickname. We don't know why either. All I know is we have been calling each other that for 10 years, so why stop now? I think my dad started that one and we kept it going way longer than it probably should have. You have such a beautiful family! What a wonderful surprise-- and all the extra work you went through to throw her off :) Congratulations to your sister! So sweet!!! I'm so happy you were able to be there and pull of the surprise. I've pulled off one surprise (to Nick at USNA his freshman year) and it was HARD! I can't imagine doing so with someone you share half a brain with! Ahh I have goosebumps! What a sweet sweet memory you'll always have! This is too sweet! I was wondering if you were going to her graduation, haha. What a wonderful weekend. Great to be part of the surprise and the celebration. Aww, that is so great! Glad you got the chance to go! You definitely made me cry with this post!!! I'm so happy you were able to surprise Danielle. Tell her I said congratulations on the nursing degree! 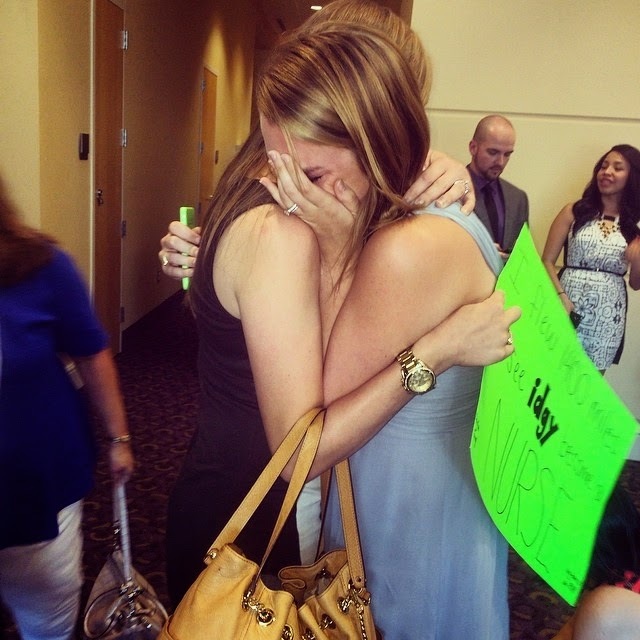 I'm so glad that you got to surprise her! Congrats to Danielle for graduating!!! Such an exciting moment for her, and it's so wonderful you were able to celebrate with her. What a wonderful surprise Chelsea. I know Danielle was really surprised. That was a special event for not only her but the family as well. Congrats to her. This is so sweet! Congratulations to your sister! You are such a wonderful sister! I'm glad y'all had a great weekend. How sweet! The main character in the movie/book Fried Green Tomatoes' knick name was Idgy! Congrats to your sister! You are sneaky...I love it! How sweet!! I got teary eyed looking at that first photo and reading the story on how you surprised her!!! ha! So awesome you got to share her special day with her!! That is so much fun. I'm glad you were able to "trick" her for this moment. I am sure she was so greatful to have it too.